Two crouching Jackals are guarding the closed entrance at the bottom of the stair well. With a Maglight torch they could see the golden reflections from the inner ears and neck ornaments of these black beasts, but their eyes created a ripple of unrest. The black pupils are lost in sea of blood. The pure white had been turned like that of a virgin. The dogs’ red tongues are hanging from their growling mouths. Their tails have curled up metamorphosing into a pair of red eyed cobras that rest in a strike position atop of the Jackals’ heads between their exaggerated ears. 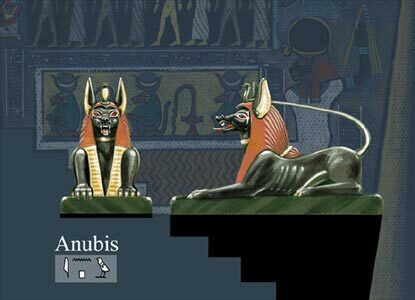 Anubis is the god of the underworld and the master of embalming the dead.